How would he be able to analyze it though? I still think Spidey has this though. All he needs to do is get Wolverine in some lava and its over. Wolverine can take so much more punishment than Spiderman its sickening. While Spidey would be pounding away forever and a day just trying to hurt a guy who goes toe-to-toe with the HULK, one good solid claw-swipe from Logan and Petey finally gets to apologize to Uncle Ben in person. Spidey: Fast, strong, fast, agile, fast, intelligent, fast, has super natural danger sense, and um, oh yeah, FAST. Not saying he moves faster than light or blink of an eye, but his reflex speed and agility make him one of the best movers and shakers in Marvel. While not an uber-character in any regard, Spidey has faced some nasty s.o.b. 's and came out ok.
Logan: Quick, strong, agile, has a vicious animalistic combat rage, healing factor, enhanced senses, and an adamantium skeleton and claws. Logan has seen it all, done it all, kicked it all, and always has never backed down from anything or anyone. I can see the fight being a long, drawn out, nasty batle, but I have to give it to Spidey. While he doesn't have the offensive training and capability like that of Logan, he can do more than our beloved Claw'd Canuck. Spidey rarely ever uses his full strength in combat, and while many think he pulls his punches, I believe it's just never occured to him to use his full super-spider strength on anyone. But when he does let loose, watch out. 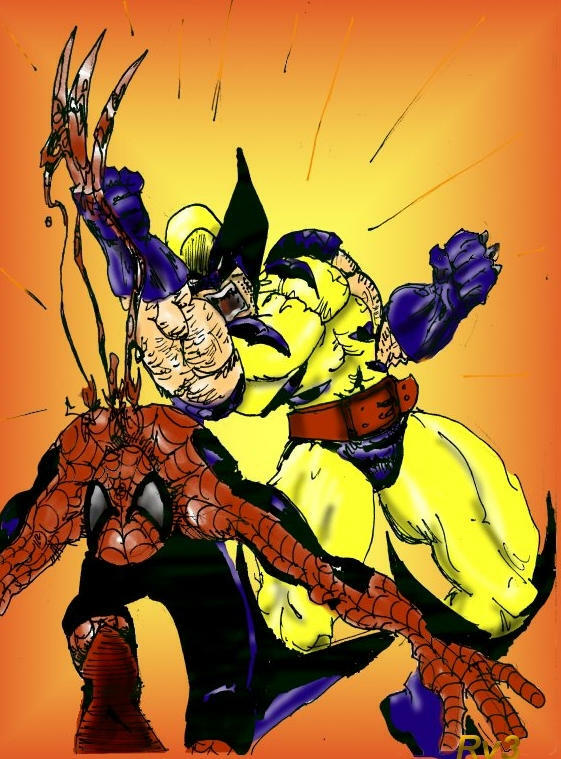 Spidey's strength can't damage adamantium in the least, but his blows are nothing to be ignored. Spidey's speed is his major advantage. He'll be bouncing about all over Logan and nailing him with the webbing and while Logan claws through the chemical goo like butter, that fraction of a second will give Peter a chance to lay in a solid hit. PhD = defeat of Wolverine. Got it. Spiderman should win this fight. It may not be easy, but here are a few reasons why I think he should be the victor here. 1. Wolverine may have super strength, but it is on a very low level. He may even have enough strength to break free of Spiderman's webbing. Either way though, Spiderman's super strength waaaaaay outclasses Wolverine's. 2. Wolverine may be fast, but he's not as fast as Spiderman. 3. Wolverine may have a healing factor, but Spiderman possesses invulnerability to a degree. I know for a fact that I'd rather have invulnerability, even if it *is* limited, than a healing factor. Why, you ask? It's simple. With a healing factor, one can still feel pain, unlike with invulnerability. 4. Spiderman has the aerial advantage due to his webbing, his ability to stick to surfaces, and his agility. -All in all, Spiderman should win this fight. However, as I stated before, it may not be easy. He will have to watch out for Wolverine's claws. One well-placed cut can kill him regardless of whether or not he possesses some bit of invulnerability. I debated this fight with a friend over the weekend. I did feel Spiderman would win 6 or 7/10 but not its about 50/50. Could go either way quickly. Besides the lava what could Spiderman really do?